The ferry has docked, the aeroplane has landed. The train has come to a halt in the station. Whatever mode of transport you have used to get to France, you have now officially arrived on French soil (French Connections). Your next mission is to find a way to travel within France. The method you choose depends on whether you have a car, a bike, a motorbike; if you want to travel in France without a vehicle and how much money you want to spend, as well, of course, on where you want to go in France! France, unlike Britain, is a country that has embraced the system of toll roads. Much of the country has auto routes, or motorways, that are run on a system of tolls. British people tend to have mixed feelings about the toll system, and it is, of course, very much up to the individual. But I have found that in areas where it operates in France the system works extremely well, with roads running freely and toll charges generally reasonable. If you have never driven abroad, it can be a little daunting as you approach the first toll booths, but it is really very simple. When you first arrive at the barrier, you simply take a ticket from the machine to your left. This will arrive automatically in most cases, you won't even need to press a button. The barrier will then rise, admitting you to the motorway. You continue on your way until either you come to a set of pay booths (péages), or until you wish to leave the auto route to take a different direction. In this case you will find pay booths at the end of the slip road or next stretch of motorway. Most pay booths are manned in France, in which case you hand over your ticket and are informed of the price. Don't worry of your French isn't good, as the price will also be displayed on a screen. Occasionally, a certain stretch of road has a fixed toll, so no ticket is issued. Toll charges are levied according to the type of vehicle you are driving, so a car will be less expensive than a van, and a motorcycle will be cheaper still. 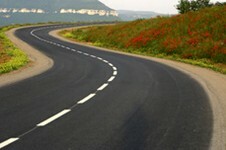 If it is late at night, on a minor slip road, it is possible that you will find an automatic pay system. Here, if you have a French bank card (this is an important point as only a French bank card will work in many of these tolls) you can pay quickly and easily (no pin required) but if you have no French card you will have to pay with cash. Toll prices are organised into five categories, with large vehicles and vehicles with trailers being the most expensive. Prices are subject to change, sometimes even according to the time of day, but can be calculated on the website http://www.mappy.com/, which also allows you to plan a detailed itinerary for your journey through France. To give some idea, however, at the time of writing, a journey from Paris (Paris Property Guide) to Nice (Nice Property Guide), in an ordinary car without a trailer, will cost in the region of 65 Euros in tolls. If you travel on motorways frequently in France it may well be worth your while investing in a télébadge, which is a remote control device that allows you to quickly pass through the Télépéage sections of the toll areas. This then charges the amount of the toll directly to your bank account. It is also possible to purchase a device that works on the same lines as a "pay as you go" mobile phone, and you "charge" your account by putting money on when you want to. To purchase these devices look under "Auto routes" in the Pages Jaunes, then find "Sociète d'Auto routes". If you travel on the auto routes you will see signs for both "Aire" and "Aire de Service". The first, the Aire, is simply a large lay-by, well set back from the road where you can park, rest, and perhaps picnic. They are usually equipped with picnic tables and toilets, and some also have areas for dog walking. The Aire de Service is the equivalent to a motorway service station in the UK, and you can usually choose from a selection of sandwiches and cold or hot meals, as well as filling up with petrol and purchasing other travel requirements. These are the alternative main roads for those who do not wish to pay the tolls on the auto routes. They are usually very good quality roads, but they are far more likely to carry slow traffic and are popular with large goods vehicles carrying massive mobile homes or yachts! If you need to get somewhere in a hurry, the auto routes would be the quicker option, but the Routes Nationales are as good as many British main roads, and better sometimes than British motorways, particularly in the south-east of England! France is renowned for its superb rail systems, so if you are travelling without a motor vehicle then consider travelling by rail, as it is an excellent way to get around. The Sociète Nationale des Chemins de Fer français or the SNCF operate the railways in France, and take a huge pride in their record of safety and punctuality. The SNCF operates the TGV, or "train a grande vitesse", and these trains really live up to their name travelling at speeds of 550 kph (350 mph). They reach most areas of France via the main lines, with routes going from Paris (French Connections -Travel to Paris and North-East France, Paris Arrondissements Property Guide) to Lyons (Lyon Property Guide), Bordeaux (Bordeaux Property Guide), Marseille (Marseille Property Guide), Strasbourg (Strasbourg Property Guide), Rennes (Rennes Property Guide) and Lille (Lille Property Guide). The TGV network is currently being extended, and more and more parts of France are able to be accessed from this service, creating new property hotspots and making property prices rise. TGV prices are no different from those on the ordinary trains, other than that a booking fee is levied. It is possible to book a TGV ticket for up to 60 days ahead of travel. It is interesting to note that, should you unfortunately contrive to miss your pre booked TGV, your ticket will allow you to transfer to the next suitable "ordinary" train. TGV tickets must be purchased in advance of travel. The "ordinary trains" (or non TGVs) are also pretty efficient, and there are stations in many large and small towns throughout France. The train is a very popular mode of transport with the French. It is usually possible to purchase a ticket at the time of travel, but do allow a short overlap of time as you can find yourself behind someone in the queue who is happily exchanging gossip with the person in the ticket office! As is common in rural France, the words "hurry up" have no meaning. It is also possible to purchase a ticket from a machine, some of which may have an English language option. It is imperative that you validate your ticket before boarding the train. To do this you need to use the special "composteur" machines, usually sited at the entrance to the platforms. This is because tickets are valid for a few days, and therefore need to be validated for a particular journey. 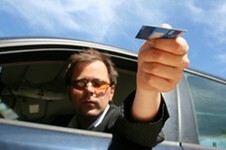 Should a ticket inspector find a passenger with an unvalidated ticket he will issue a fine. Special rates can be obtained for families, OAP s, students, disabled people and regular commuters. It is also possible to buy a holiday ticket (billet séjour), but to do this you will need a letter of verification from your employer. Domestic pets can travel on most French trains, at a charge of half the second class fare. If a dog is very small or if you have a children's rail card you may be able to take a dog or cat for free as a family pet. (Travelling to France with Pets.) Bicycles are very popular in France, and cycling is considered a national sport (Sport in France). Many French and foreigners make cycling the basis of their holidays, and use the trains in order to get to the mountains, or to other good cycling areas. TGVs will not transport bicycles, but most regional and local other service trains have places to store bikes and accept them as hand baggage, though this is always subject to space. Long distance trains take bicycles separately, and these should be registered in advance. You are warned that it can take up to five days for delivery, although in practice this is often quicker. National lines will charge a transportation fee. France has many domestic airports, and also domestic flights that operate from the international airports. Check out the domestic flights available from whatever international airport you are flying into from Britain, and you may be fortunate enough to find a suitable flight to your destination. Air France is responsible for a large percentage of domestic flights, so its website should be informative (http://www.airfrance.fr). Competition from the popular and efficient TGV network means that prices have been reduced, so domestic flights can be a reasonable way of travelling from city to city. Hiring a car in France is roughly the same as hiring in Britain. You should have with you your licence (both parts, card and paper) at the time of pick up, and don't forget to give the car a thorough check before you drive away, preferably in the presence of the member of staff who shows it to you. The French are actually less picky about minor scratches than the British (in general!) but it pays to be on the safe side, and if you spot any damage to the car before you hire it, it is wise to point it out to the company. The main ways of getting around in France are detailed above. There is, however, another method that is quite popular, especially amongst the young, and that is the long established practice of hitch hiking. It has largely died out in the UK due to the inherent dangers of abduction and assault, but rural France is a seemingly safer environment, and many youngsters think nothing of hitching to and from school, or home from a night out. Longer distances are also commonly travelled in this way, frequently by students holidaying on a budget, but it should be made clear that although it is rare for there to be problems, hitch hiking will always carry risks and is not advised. On a personal note, however, there are certain hitch hikers who are a common sight around my home in the Languedoc (Languedoc-Roussillon Property Guide, Languedoc-Roussillon Property - an insider's guide). They are monks from the local monastery, and they use hitching to travel all over France as they are not allowed to carry money. Needless to say, most drivers feel safe enough picking them up! Whatever method you take to get you about in France, chances are that your journey will go smoothly, as France has a very well established travel infrastructure in most regions. Bon voyage! I have just found a link to your website which mentions about purchasing the regional toll passes for your car, which makes it easy when it comes to going straight through at toll stations without the need to stop and pay. We have two of these passes for our cars (mine is for the whole of France, and my husband has one for the Chambery area), but would like to know whether this pass would work in a hire van (luton van), and if it would just charge you more on your monthly toll bill. Some people say yes, some say no, and despite sending two emails to the AREA customer services they don't reply. Thanks for contacting us. My colleague Joanna in France says she used to use someone else's car pass on her van, and they were not asked for more money for this. But she doesn't know if the owner of the pass was then billed. I'm sorry not to be of more help, but hopefully a visitor to this site will be able shed more light on this subject. Hi - could you please let me know if there is a reduction for being disabled and if so how do I get this?